healthy super moist chocolate zucchini muffins with a hint of peanut butter that make the perfect snack, breakfast, and after dinner treat. They are gluten free and of course, dairy free! I have been wanting to update my paleo chocolate zucchini bread on my blog, even though personally it doesn’t need an update- it is so good! BUT, I wanted to make with ingredients that you might have on hand already or be able to use the leftover with another recipe! The paleo recipe calls for coconut flour and personally I have a hard time using that ingredient in other places, but this time I made it with almond flour. I feel that it is a bit easier to incorporate it into other recipes (like these; my grain free chocolate chip cookies) or into energy bites, breads etc. It isn’t that you can’t use coconut flour in those types of recipes, but it tends to need more liquid and can be a little more difficult to bake with or sub. I kept these chocolate zucchini muffins low in sugar (about 1/4 cup coconut sugar) because I wanted them to have more of a dark chocolate taste. I also added peanut butter into the mix, but you can 100% sub ANY nut/seed butter of choice. I did not test any other flours, but you won’t regret buying almond flour! I love these little muffins because not only do they taste delicious but we are sneaking in some veggies, healthy fats, and protein in each one! Something you can feel good about eating without feeling a sugar crash later on- which always seems to happen to me when I eat store bough baked muffins or breads! Also; if you want to make this into bread you can! I just prefer little muffins because they are easy to grab & go or freeze! If you decide to make this into a loaf, you will need to cook it for about 1 hour; check a few times and when a knife comes out completely clean- it is done! I love these as is cold out of the fridge, in a yogurt bowl, or heated in the oven with a smear of peanut butter on top…amazing. The ingredient list might look line but trust me, you will use these ingredients over and over again and they are filled with all good things! If you make the muffins let me know or the paleo zucchini bread on my blog! optional add ins: chopped walnuts or dairy free chocolate chips. Preheat your oven to 350 degrees. Prepare a muffin tin with liners or spray with olive oil/coconut oil. First prepare the zucchini. Either with a grater or your food processor; grate/chop into fine pieces. Allow to release some of the moisture BEFORE. (They will be too wet if you skip this step) Simply; place on a paper towel then squeeze it out before adding it to the bowl. In a separate bowl, add the wet ingredients and mix with a spoon until well incorporated. Combine the the wet with the dry. Mix. Scoop about a heaping 1/4 cup into your prepared muffin tins. Bake at 350 degrees for about 25 minutes. I checked after 20 minutes and decided it needed 5 more minutes. Allow to cool, then remove from pan! Store in the fridge for up to a week or freeze for longer!! You can sub the peanut butter for ANY nut/seed butter. I haven’t tested any other flours, but if you are; I would start with whole wheat flour. Brown sugar or stevia will work for sugar subs. I did not test a liquid (honey, maple syrup) but if you do, I would suggest cooking the muffins for another 5-10 minutes. Allow the zucchini to release some of the moisture before you mix it in the bowl. You can do this while you are preparing the rest of the recipe. Freeze for longer and let them thaw out over night or heat in the oven at 400 degrees for 10 minutes or so! Simple hemp blueberry cookies that are perfect for breakfast or a quick snack on the go. I have this feeling that every time I write up a blog post, no one actually reads it and immediately scrolls down for the recipe...in that case, I am going to keep this pretty short. For over a week we didn't have a working fridge in the apartment. I was going a bit crazy not being able to cook my own meals; granted I love being able to eat out and feel lucky enough that I was able to do that during that time, but I love being able to cook; it is stress reliever to me and just makes me feel better on the inside rather than constant take out. With the fridge finally being fixed yesterday, I started meal prepping and making a few snacks to have on hand right away. I am trying to constantly change up my snacks, lunches, proteins, veggies each day- it makes me feel better- so I made a few of these breakfast cookies! Honestly, they are so simple! They came out crunchy on the outside edges, a little gooey in the middle, naturally sweet from the mashed banana and blueberries and they only take about 15 minutes! For these hemp blueberry cookies, you just need one bowl to mix together banana, vanilla, sea salt, cinnamon, almond flour, ground flaxseeds, blueberries, turmeric and a little sweetener if you need it! I topped them off with shredded coconut and hemp seeds, but you can do whatever you prefer; chia seeds, goji berries, coconut sugar, or nuts. Once everything is well combined you scoop out the mixture into little cookies, bake them in the oven for about 15 minutes until the bottom and the edges start to brown. They resemble the top of a muffin to me - the best part! That's it! I store mine in an airtight container in the fridge for up to 5 days. optional add ins: half squeeze of lemon, chia seeds, ginger (powder), chocolate chips, seeds, 1 scoop of protein powder, chopped dates etc. toppings: hemp seeds, shredded coconut flakes or chocolate chips! 1. Preheat your oven to 375 degrees. Line a baking sheet with parchment paper and set aside. 2. In a medium sized bowl add all of the ingredients except the blueberries and mash together until well combined. 3. Add the blueberries into the mix and gently stir. 4. Using a spoon scoop out enough to make 6 cookies. 5. Bake at 375 degrees for 15 minutes until golden brown. 6. Top with toppings of choice and allow to cool completely before storing in the fridge. If you want to add in sweetener, I would suggest maple syrup, coconut sugar, stevia, or honey. If you are using a liquid sweetener you may need to bake them a bit more and add in 1-2 extra tbsp. of flour. The banana I used was green and firm, but if you prefer a spotty banana that will work too! The cookies will be a bit sweeter. These breakfast cookies aren't very sweet, which is perfect for me, but if you have a bit of a sweet tooth you may need to add in a sweetener of choice to the batter. OR if you give them a try sans sweetener, and feel they need a little after trying one simply sprinkle coconut sugar on top! A sweet and savory granola mix that is low in sugar, crunchy, a simply one you can feel good about. Today I am sharing my recipe for: TURMERIC CASHEW BUTTER GRANOLA! A little bit savory, lightly sweetened with maple syrup + a few chopped dates. The granola came out a little chunky, crispy and so satisfying! I love the combination of creamy cashew butter, shredded coconut flakes, almonds, chopped dates with the few savory spices. Once you realize how simple and easy it is to make your own granola, the chances of buying store bought are pretty slim! I love that you can control the ingredients, make it super crunchy or crumbly, and really just cater it to any needs that you want - taste, texture, sugar content, nut free- the list goes on. it won't drag you down but nourish you instead! After making granola a few times myself, I have found that baking the granola at a low temperature for a slower time and then allowing it to cool on the stove top for a bit, really is key! It lets the granola crisp up without burning! I have made the mistake before trying to bake at a high temperature and everything just completely burned and baked unevenly. 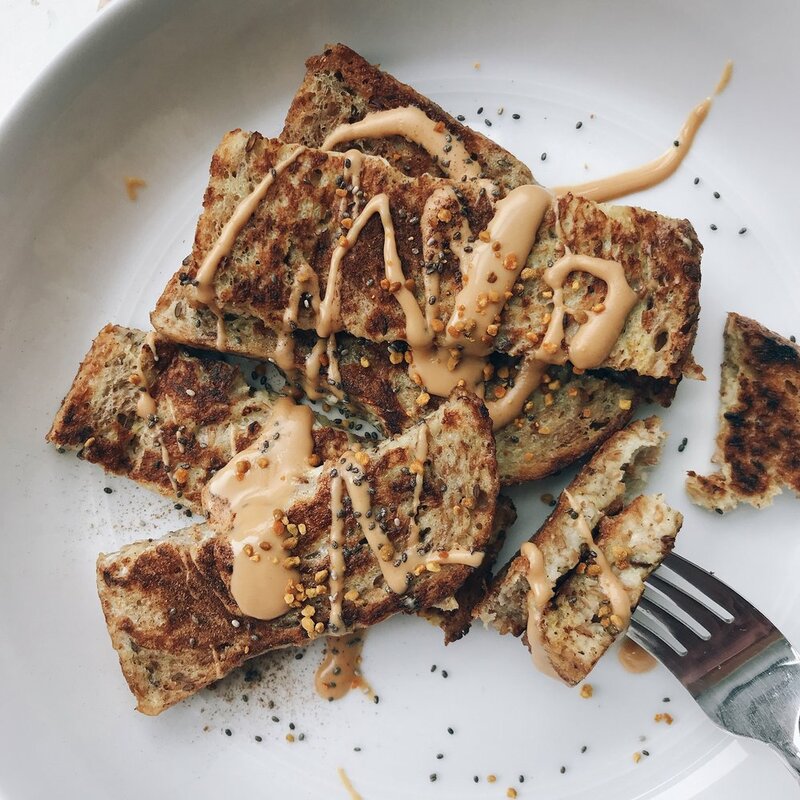 I used all of my favorite flavors here in this recipe and I decided to use cashew butter because a friend of mine; Athena @southernhealthyliving had sent me some of her homemade cashew butter- it was so creamy, lightly sweet, and just to die for! I added a few spoonfuls to the recipe, but feel free to use any nut butter or seed butter of choice! Once you mix all of the dry ingredients together and combine it with the wet ingredients; you just slowly bake it in the oven until it becomes crispy! You can also swap out any of the nuts for seeds or use more of less of the spices listed! That is what is so great about making your own! To make the granola on the chunkier side, I tend to not slice the nuts that I am using or simply slice them in half. Then, after coating the dry ingredients with the wet ingredients, I pour it on the baking sheet and using my hands I form little clumps. Lastly, when I am turning the granola so all sides can evenly cook I will carefully with a spatula or large spoon and flip the granola so it stays together as best as possible! It will last about 1-2 weeks in the fridge! Total time: less than 1 hour. 1.5 cups gluten free oats, quick cooking is fine! 1. Preheat your oven to 275 degrees and line a baking sheet with parchment paper. Set aside. 2. In a large mixing bowl add all of the dry ingredients and mix until well combined. 3. In a smaller bowl, combine all of the wet ingredients and mix. I simply melted all of the ingredients together on medium heat until melted. 4. Pour the wet ingredients over the dry mixture and mix until everything is coated evenly. 5. Pour the granola mixture onto your baking sheet and clump some of it together in larger chunks. Spread the remaining equally on the pan, so it bakes evenly. Finally! I turned my favorite nighttime drink into a smoothie! I live for a hot golden milk at the end of the day and can never pass down the opportunity to order a dirty turmeric almond milk latte when I see one on a menu (which is basically exactly as it sounds, plus a shot of espresso). I love smoothies in the morning because they are quick, easy, and my body seems to be able to digest something like this first thing. You all know my normal go to smoothie that I have almost every other day, so I thought it was time for a change up, since your body does need that; it is good for your gut. This smoothie is pretty simple to follow but loaded ingredients that will make your gut happy, your skin glow, and just feel so good. To make this thick, I used steamed then frozen cauliflower as the veggie, which you can't taste, frozen banana, ground flaxseed for some added fiber and then the usual suspects, lots of turmeric, cinnamon, ginger and a pinch of nutmeg. All the spices you would expect to see in a turmeric/golden milk latte or drink! To take it one step further, I added in Vital Proteins Marine Collagen Peptides. Full disclosure, the more I started to use the collagen in my smoothies, energy bites, mixing it into my yogurts, and even coffee, my hair was growing faster than ever, my nails were stronger, I had more energy, and the best part was the improvement of my gut health- which you know is a huge plus for me since I've dealt with leaky gut, SIBO, IBS, and gastroparesis! I felt that it was repairing the lining of my gut and just making it so much stronger! I use the Marine Collagen Peptides, because I have an intolerance to beef, but they both are easily mixable into ANYTHING and you can't taste it at all! So you get these amazing benefits without sacrificing taste! I made this Blueberry Lavender Lemon Smoothie with one of their beauty waters, here, a cacao oatmeal bake, and this super easy sweet potato salad with a mustard bone broth dressing, using their bone broth! Their products are super versatile so you will never get bored with them and can constantly change up as to how you are adding them into what you are making or eating for the day! Anyways, I added in one scoop of the collagen to the smoothie which also contains 11 grams of protein, plus the remaining ingredients below for a really gut friendly and healthy smoothie! I also love how turmeric is anti-inflammatory and I truly believe that is has help cause less inflammation in my body, especially helped ease any tension in my digestive area! This smoothie is both sweet and savory; savory from the turmeric and ginger, but the cinnamon gives it a little sweetness along with the banana. I think this also makes the perfect fall/winter smoothie since these spices are warming or healing spices to me! If you want to stay away from bananas you can totally replace it with pineapple or mangos or keep it completely fruit free and add in a date or a touch of honey! Either way it is so delicious! 1. First add all of the ingredients besides the frozen banana and the ice to your blend and blend until well combined. 1. Use canned coconut milk for a more richer, thicker, smoothie. 2. If you can not tolerate bananas try using pineapples or mangos! 3. To keep this low in (as in none!) sugar, simply nix the banana, add more cauliflower to make it thicker! You can add in 1 date. 4. The measurements of spices will greatly depend upon your taste buds! Use mine as a guide! Granola tends to be a weakness of mine, but I typically do not buy it from the stores because of the ingredients most have; such as added sugars or dried fruits. I also love when granola is on the clustery side and find it so disappointing when you buy granola and it is crumbly or stale! Making your own granola is so much easier than you think. You are really just putting all the ingredients you want in one bowl, mixing it up, and allowing it to set in the oven, which is why I tend to make most of mine at home! The prep time is very minimal and it only takes about 30 minutes in the oven, but you are left with granola that you can feel good about, that is super satisfying, and full of all the flavors that you want it to be! - whether it is sweetened, unsweetened, vanilla, maple cinnamon, or like this one: a chocolate reishi cold brew granola! This homemade granola is grain free, is full of chocolate flavor, hints of coconut, a little salty, a tad bit sweet from the maple syrup, and has a little mocha/coffee flavor from the Reishi Cold Brew elixir that I used from REBBL! This is one of my favorite REBBL drinks, because it has no added sugars and I love the benefits of reishi! I am pretty sure I haven't seen a drink like this out there, with a combination such as this- no added sugars, one filled with adaptogens, and that actually tastes super creamy and satisfying. I am excited that REBBL came out with a drink focusing on this aspect! REBBL drinks are coconut milk based, so this reishi cold brew drink is extra creamy and smooth! It isn't acidic like most other coffee tasting drinks, that usually can upset your stomach, and like I mentioned before it is very low in sugar and has over 9 grams of fiber! I also love that it has reishi because it is known to have a calming affect calming on the body, support your immunity, as well as support to obtain a long and healthy life! Reishi is an amazing adaptogen, which are herbs and substances that increase the body’s resistance to stress and help it overcome all health challenges more quickly. I think that reishi, is THE thing in 2017. It is getting a lot of buzz lately, but the benefits are so worthy to the body, that it's worth adding into your everyday eats! So, not only is this granola delicious, but it also has amazing health benefits too! You can also see other recipes that I have created using the REBBL elixirs, like these raw maca mocha coconut fudge cups or these savory turmeric carrot fritters. For this granola, I chose to keep it pretty simple by using almonds, cashews, and walnuts as the base! I created a liquid so everything would clump together- hence how the clusters are born in the oven!- by mixing together the Reishi Cold Brew elixir with chia seeds, coconut oil, almond butter, and maple syrup! Then, you simply mix everything together by hand, pour it over a sheet pan and bake it in the oven! Half way through, you carefully want to flip the granola but make sure that you do not let the pieces break to ensure you have some clusters in your granola! When it was completely finished, I allowed it to cool off on the pan in the open air to let the granola crisp up a bit and sprinkled it with a little bit of cacao powder, extra coconut flakes and just a little coconut sugar! I keep it stored in the fridge for up to a few weeks! This would make the perfect topping for your yogurt bowls, smoothies, and packing it up into individualized little bags for on the go while you are out and about during the summer months! It is such a great snack to have on hand for everyone! 2. Mix together the chia seeds and the reishi cold brew REBBL Elixir. Set aside for at least 10 minutes. 3. In a large bowl add the dry ingredients: walnuts, coconut flakes, almonds, cashews, cacao powder, cinnamon, and the sea salt. 4. In a smaller bowl combine the maple syrup, coconut oil, almond butter and add the chia + reishi cold brew mixture. Stir until well incorporated. 5. Add the wet mixture to the dry mixture and give it a good stir, by using your hands. 6. Spread out the mix evenly on the baking sheet. At this point, you can somewhat control the size of the granola. I prefer chunks, so I scrunch some of mix together with my hands. This will allow the granola to stick together while it is baking in the oven. 7. Bake on the bottom rack of the oven for 15 minutes. After 15 minutes take the granola out of the oven and give it a gentle mix. To keep the clusters together lightly flip the granola. 8. Place the granola back in the oven for another 20 minutes. Careful that the nuts do not burn, check periodically. They will be a golden brown color. 9. Leave the granola on the pan for another 10 -15 minutes once it has finished in the oven. The air will give the granola a nice crunch! I tend to leave mine on the pan for an hour or after the 15 minutes I will put it in a container without the top for a while. You can use any nut butter of preference. I would stick to a creamy one, so it is easier to mix. If you are adding in anything else to the mixture such as chocolate chips, dried fruits, or goji berries, I would add them in once the granola is finished as they will tend to burn in the oven. If you do not have the reishi cold brew, you can sub almond milk/coconut milk, but the reishi cold brew will give it a such a great mocha/chocolatey taste! Be careful when you flip the granola if you want it to stay in clusters! Two ingredients, 10 minutes, homemade creamy roasted cashew butter. Recently I started getting back into making my own homemade nut milks after realizing how simple, cheaper, not only better tasting it was but how better I was feeling not having all the added fillers and sugars in store bought brands. I always always checked ingredients, but it was impossible to find ones with out added gums or other ingredients I couldn't comprehend, this morning, I decided to make my own cashew butter - primarily because I wanted to make more energy bites for my upcoming trip to CA and secondly because I bought the wrong kind at the store the other day that was filled with sugar and oils that caused inflammation to the body. I was going to use it and say the heck with it, but why? Why add all these unnecessary ingredients to my body when I know that my body will react poorly to them? Why would I want to actively do that when I have cashews in my kitchen, a food processor, coconut oil and can simply make my own! It is simply that easy to do. I have started to notice that eliminated all of these gums, extra omega 6 oils (sunflower oils for example), added sugars from my diet have really started to make me feel better- less bloated, less stomach pains etc. Yes it is convenient to buy nut milks and nut butters, but it is also very simple to make them, cheaper, and tastes I think, so much better- maybe because you realized that you made it yourself. I decided to roast the cashews to intensify the flavor, but it isn't necessary. I added 2 tbsp. of coconut oil because I like it a little bit on the thicker/chunkier side, but if you prefer it a little creamier/oily just add in a bit more! You can add anything you like, sea salt, vanilla, cacao powder, cinnamon, cacao nibs or a combination or all! Store it in the fridge to keep it fresh for longer or keep it on the counter top and just give it a stir before you use! 1. Line a baking sheet with parchment paper and pre-heat the oven to 400 degrees. Once ready, roast the cashews for 7-10 minutes. *Make sure they do not burn, you will begin to smell the cashews and they will have a nice golden brown color! 2. Transfer the cashews to your food processor with 2 tbsp. of coconut oil. 3. Grind the cashews until you have reached your desired consistency. You will need to scrap down the sides of the food processor and have some patience! It will take about a total of 10 minutes to form together. If the mixture still seems dry, start off by adding 1 tbsp. more of coconut oil. Add anything into the mixture you would like: sea salt, cinnamon, cacao powder etc. Roasting the cashews isn't necessary, it simply intensifies the flavor. Use any nut that you would like. You may need less oil for others, haven't tested it. Store in fridge for longer or at room temperature.